Competing with their brand new Dallara chassis race cars, qualifying for the Honda Grand Prix of St Petersburg represented the a major milestone for teams and drivers of the IZOD INDYCAR Series. A chance to claim the honour and technical advantage of being the first driver to master the open wheel series' new specifications, the 2012 contenders of the IZOD INDYCAR Series looked forward to mount a strong offensive. After the first qualifying session for the 2012 IZOD INDYCAR Series on the streets of St Petersburg, there is a sense of whatever old is new again as Team Penske's road warrior took pole position. Lapping the 14-turn, 1.8-mile temporary street course at 1-minute, 1.3721-seconds, Power's #12 Penske Racing car was a little more than half a second faster than his pole-winning time in the 2011 St Petersburg event. "It's a good start. It's only the beginning of the weekend. We need to have a good strategy for the race and see what comes." said Power in post-race. 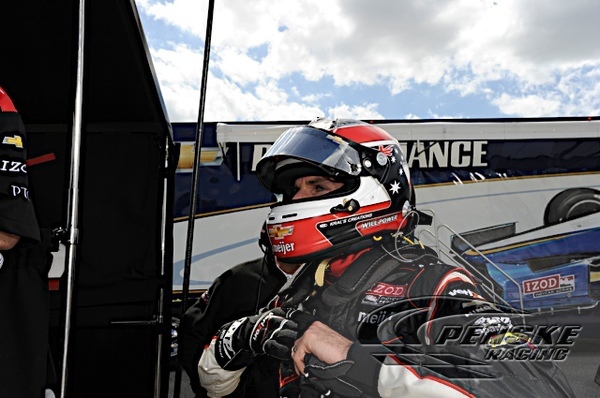 Will Power's pole with Chevrolet power for the Honda Grand Prix of St Petersburg was the first time since July of 2005 that the Bowtie brand would take an INDYCAR field to green. The start of the Honda Grand Prix of St Petersburg race for the 2012 IZOD INDYCAR Season will also be the first in 18 years that a Chevrolet-badged engine powers the pole-sitter at a road course. Emerson Fittipaldi put a Roger Penske-owned car on the top starting spot at the Grand Prix of Monterey at the end of 1993. For an all-Team Penske front row, Ryan Briscoe's #2 Dallara DW12 was little more than 2/10ths of a second slower than Will Power. A 2009 winner of the St Petersburg INDYCAR Series event, Briscoe's victory was one of four by Team Penske machines. By using the first 2012 IZOD INDYCAR Series qualifying session as a judge, it appears the brand new Chevrolet V-6 INDYCAR engine has promptly reached its performance zenith. Along with supplying power for the pole-winning Will Power's Penske Racing Dallara and his teammate Briscoe's car, seven of the top-10 in qualifying for the St Petersburg event were Bowtie-wearing entries. Also running Chevrolet engines, the second row for the Sunday street race will feature an Andretti Autosport duo. Drivers Ryan Hunter-Reay in 3rd and James Hinchcliffe in 4th separates the third Team Penske of Helio Castroneves from his front-row starting teammates. French INDYCAR rookie Simon Pagenaud ushered the #77 Schmidt-Hamilton Motorsports Honda-powered Dallara into the Firestone Fast Six. Ended up 6th fastest after qualifying, Pagenaud was the quickest Honda in the time trial session. However, the #77 will be assessed a 10-grid position penalty for an unapproved engine change during practice. For what is likely Honda's top team, Target Chip Ganassi and the other Chip Ganassi Racing two-car organizations were based around the mid-pack in qualifying. Qualifying 7th, Scott Dixon will inherit 6th place on the grid from after Pagenaud's penalty. Reigning IZOD INDYCAR champion Dario Franchitti will begin his title defense in 9th place on Sunday. Admitting that the Target Chip Ganassi team missed the set-up in qualifying for the first 2012 event, Franchitti uttered in post-qualifying interview, "I don't think its by accident the Chevy guys were up there. We'll just keep our heads up and get the work done. We still have some tricks up our sleeve.". In the Chip Ganassi Racing #38, Granham Rahal was 11th fastest in practice disappointed with his effort on Saturday. Finally, sophomore IZOD INDYCAR Series Charlie Kimball had major struggles to end up 22nd in the time trials. While Chevrolet and Honda engined cars appeared competitive, questions surround the Lotus engined drivers. The highest starting competitor to be running a Lotus-powered Dallara DW12 will be Alex Tagliani in 17th spot. Starting at the back of the 2012 Honda Grand Prix of St Petersburg is the two-car Lotus-Dragon Recing cars of Katherine Legge and Sebastien Bourdais. While the Lotus-powered INDYCAR teams for 2012 appear to show an engine that is off-pace, their customers consist largely of developing teams without the thick notebooks as the established teams running Chevrolet and Honda powerplant. The premiere event for the 2012 IZOD INDYCAR Series season, the Honda Grand Prix of St Petersburg will be set to start at 12:30 PM Eastern time Sunday.